No one enjoys being put on hold…wait, no, that’s not true. We’ve heard many people ask to be put back on hold to hear the rest of the on hold messages they were listening to. But no, typically, no one likes to be put on hold. People hate to wait, and being put on hold means waiting. To make matters worse, callers often end up confused by the silence on the other end of the line, or bored with the stock music and cold, canned rhetoric. Business has always been done over the phone, but as online shopping has surpassed brick and mortar traffic, over-the-phone sales have reached an all time high. A recent study by Marchex shows in 2015 Americans spent more than $1 trillion in mobile “click-to-call” commerce. Consumers increasingly use mobile phones for business lookups. Advisory firm BIA/Kelsey estimates there will be 93 billion consumer-to-business phone calls from smartphones in 2016. This number is expected to grow to a whopping 162 billion by 2019, more than double the number calls received as recently as 2014. These are eye-popping numbers. What’s even more startling is that 20% of these calls from mobile phones are dropped, according to the Marchex. Calls get dropped for a number of reasons, but statistics tell us that 34% of callers who hang up while on hold never call back. That’s a big piece of a trillion dollar pie. The good news is, you don’t have to let all these callers off the hook. With creative, professional sounding on hold messages your business will not only retain customers holding on the line, but it will generate revenue by marketing additional products and services. So now you see the value in on hold messaging as a way to engage callers, but how exactly do you go about using your hold button to drive revenue? When it comes to your on hold messaging, silence is not golden. Dead air on the other end of the line is not only a waste of a golden opportunity, it can leave callers frustrated, questioning whether or not you’re still even on the line. In an ideal world you’d never put a caller on hold, but since most of the time that’s not a reasonable expectation for those tasked with receiving calls, your hold button is necessary. Callers on hold offer you a captive audience for a small window of time. Even thirty seconds can be extremely valuable. Advertisers will pay millions of dollars for a thirty second Super Bowl commercial. Take advantage of your time. Don’t leave callers hanging. Say something relevant. Start with the easy stuff. What are your hours? What areas do you service? Do you have multiple locations? First rule of message on hold: don’t talk about message on hold. Saying things like, “Your call is very important to us. Please hold while our operators are assisting other customers,” often has the reverse effect of soothing callers. This kind of messaging simply reminds callers they’re being forced to wait while you assist more important callers. If your messaging repeats this phrase over and over again, you’ll likely exhaust any patience your caller may have had. While we’re on the topic of what not to say, we advise our clients to never apologize to callers for putting them on hold. Some people may think of it as common courtesy, but callers aren’t looking for an apology, their looking for a human to pick up the phone. Thanking a caller for the call is perfectly acceptable, but apologizing for placing callers on hold once again reminds them they’re stuck in limbo. The goal would be to engage them to the point where they forget they’ve been put on hold at all. 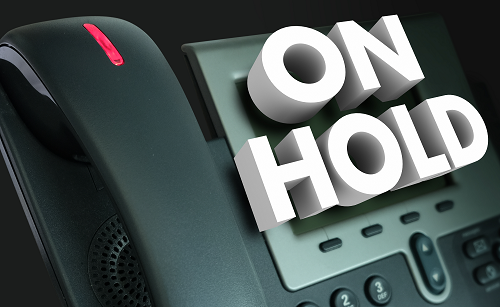 Hold time is a great time to offer callers additional products and services. Hotels should take the opportunity to talk about premium suites. A car rental company might present information about larger vehicles, insurance, children’s car seats, or navigation systems. A plumbing company might want to introduce the new tankless water heaters they offer. You’re business likely has various lines of products and services. If your callers are only purchasing one of your offerings, hold time is a great opportunity to present lesser known items. A retirement community would be wise to talk about its free shuttle service to shopping or doctor’s appointments. Prospects calling to schedule a visit may otherwise never discover this feature. For a pack and ship store, introducing print services to callers tracking packages could boost a whole new segment of business. Geothermal heat pump? What is it and why would I need one? Highlight the recent awards you’ve been presented. Do you support your community by giving back in ways that bring meaning to your company? Maybe you give to kids through the “Make-a-Wish Foundation,” or you sponsor local youth sporting events, or you challenge your employees in food drives. On hold messages are an ideal vehicle to deliver this information to your client. Every business loves more web traffic. After all, what good is a slick, shiny website if no one’s there to see it? You may only get 20-30 seconds of on hold time to market to your caller. If you introduce them to your website during this brief window, they can discover everything they need to know about your business at their convenience. Drive callers to your website with on hold messages and see a dramatic increase in online orders, app downloads, blog views, or whatever your business is seeking. Send them to your social media channels for added engagement. This goes without saying, right? You’d be surprised, though, how many businesses wait until the last minute to update their message on hold program, and try to throw something together in a rush. You can get involved in the script writing process as much, or as little as you want. But you’ll want to at least provide several bullet points, reference materials and basic direction for your copywriter. If you’ve ever watched a low budget car dealership commercial, you know the value of professional on-air talent. The voice of your on hold messages will reflect your image and your image determines the value of your brand. Even if you communicate the right message, if you don’t do it the right way, you could lose out on business. If you’re updating your message on hold program regulary (of course you are) you’ll need a voice that fits each message. Different message programs call for different deliveries. Tone, inflection, and even accent matter, and not every former radio DJ fits the bill, much less every business person. A creative on hold marketing message might use character voices to entertain and engage callers. A seasoned voice talent is a non-negotiable in these recordings. I said in the beginning that some of our on hold messages have prompted callers to ask to be put back on hold. We call this the holy grail of message on hold. It’s like the spit-take for a stand up comedian. Nine out of ten programs that have achieved this feat contain a bit of humor. Others might contest their business is too serious or too boring to use humor. Granted, their might be certain solemn occasions to avoid joking, but as a general rule the only time to avoid using humor is when it’s not funny. The Financial Brand recommends putting comedy routines into on hold messages as the #1 fun marketing idea for banks and credit unions. If banks can be funny, anyone can. If all you hear is silence, don’t delay. Not only will on hold messages help drive sales and revenue, they will dramatically improve caller experience. If all you hear is music, it’s time to change the way you look at your on hold programming. Any time you have the attention of your customers and prospects, you have a marketing opportunity. If you have message on hold programming that hasn’t been updated since you-don’t-know-when, now is a great time to refresh your content. HOLD PLUS allows customers to update regularly, even offering unlimited updates. People change, the weather changes, hours change, and products and services change. To incorporate message on hold into your business’ marketing efforts, you’ll want your on hold messages to reflect the brand’s content across all platforms. All the effort of crafting an effective on hold message doesn’t have to fall on your shoulders either. Premier Companies’ talented team of script writers can help you bring your concept to life – even from just a couple of bullet points or a page from your website.